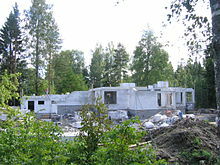 House-building is the construction of houses. According to data from the U.S. Census and Bureau of Labor Statistics found the average floor area of a home in the United States has steadily increased over the past one hundred years, with an estimated 18.5 square foot increase in the average floor area per year. In 1920, the average floor area was 1,048 square feet (97.4 m2), which rose to 1,500 square feet (140 m2) by 1970 and today sits at around 2,657 square feet (246.8 m2). Some have criticized the house-building industry. Mass house-builders can be risk averse, preferring cost-efficient building methods rather than adopting new technologies for improved building performance. Traditional vernacular building methods that suit local conditions and climates can be dispensed with in favour of a generic 'cookie cutter' housing type. ^ Gordon, Aaron. "Approaching Home Construction". Aaron Gordon Construction Inc. Archived from the original on 13 February 2015. Retrieved 13 February 2015. ^ Comen, Evan. "The Size of a Home the Year You Were Born". 247wallst.com. Retrieved 2019-01-28. ^ a b Arieff, Allison (October 2, 2011). "Shifting the Suburban Paradigm". The New York Times. Retrieved 2013-11-03.